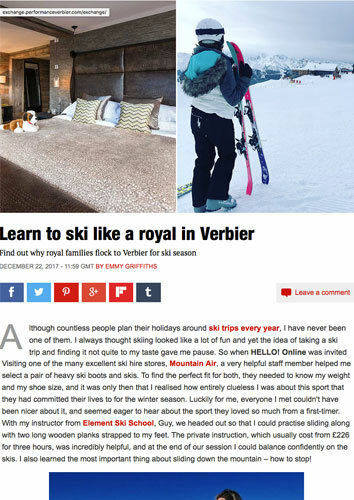 When Emmy from Hello decided to learn to Ski in Verbier she was placed in the expert hands of Guy and Georgia – and after a few lessons she was desperate to ski more and had already planned her next holiday… Naturally she also took a great deal of interest in the celebrity-side of Verbier’s regular skiers. 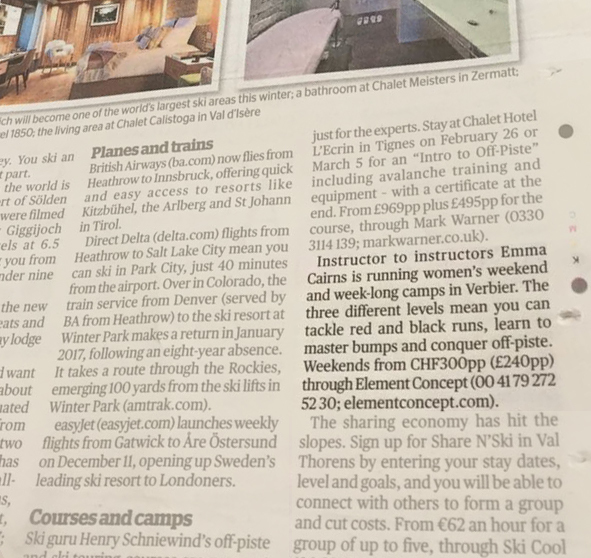 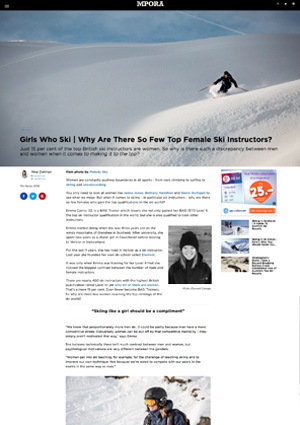 We were very happy to see the Women’s Camps covered with a great article in Ski & Board after Leslie Woit joined Emma for one of the week-long camps. 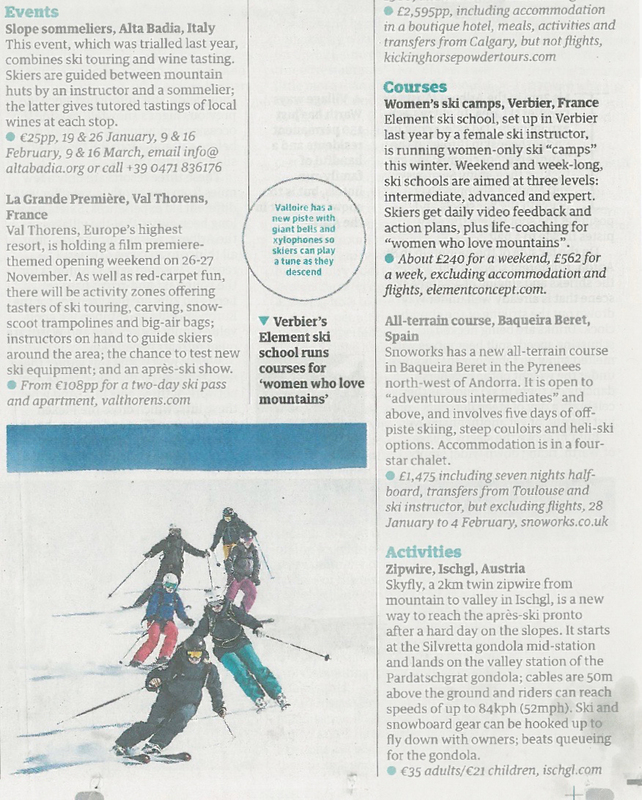 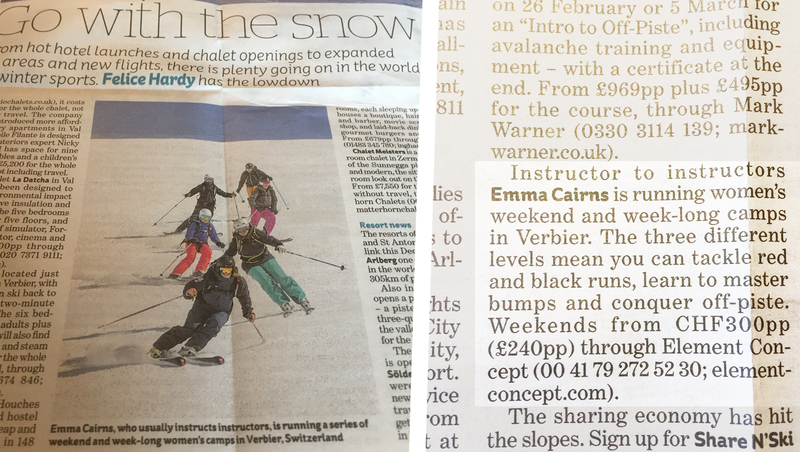 Before every season The Guardian runs stories about the latest new developments and news from the mountains, and we’re very happy that our Women’s Camps weren’t just covered, they put the ski school top of the bill. 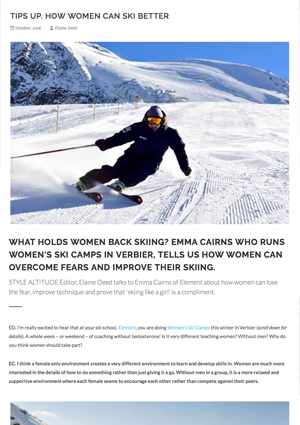 Felice Hardy covered Emma and the Women’s Camps in her preview of the winter 2016/17 season, and the article also featured on their website. 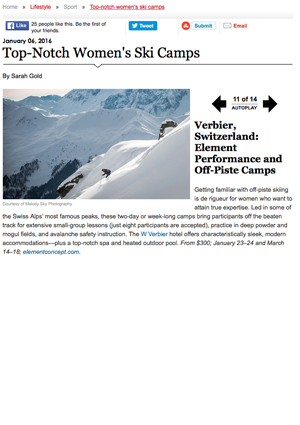 More very high profile endorsements of Element ski School and our Women’s Camps. 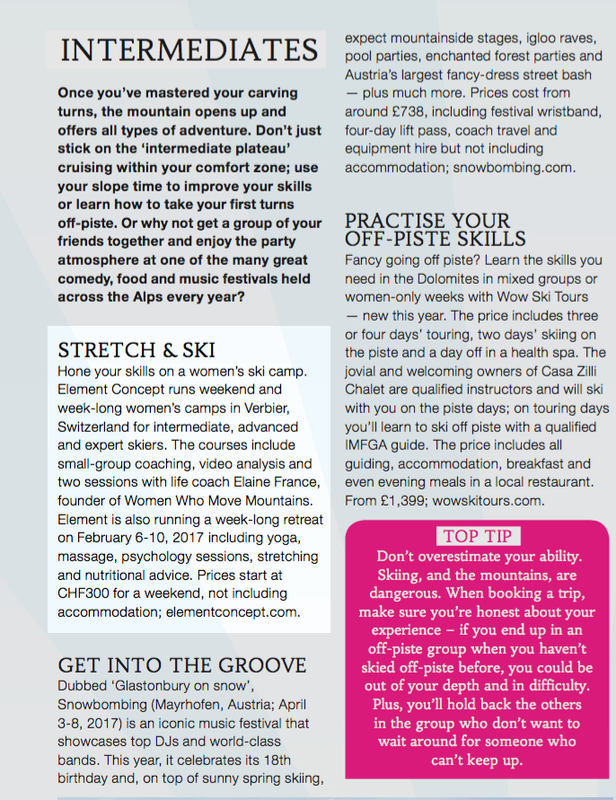 As a review of what’s new and exciting for the 2016/2017 winter season, Element once again our Women’s Camps were featured as an exciting new type of ski lesson, with Emma getting a write up and a rather nice photo to boot. 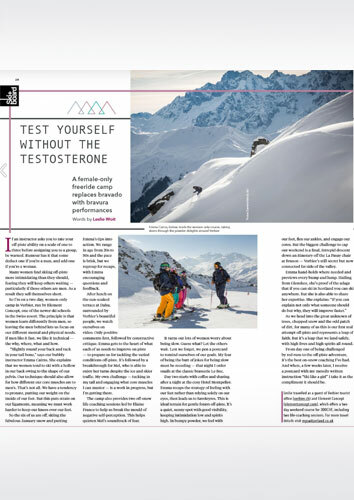 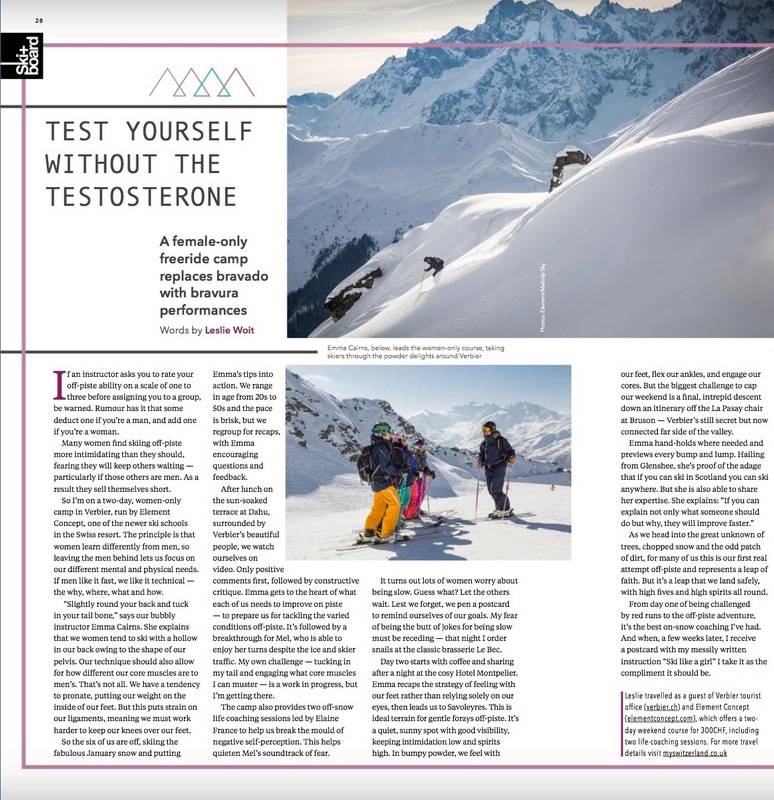 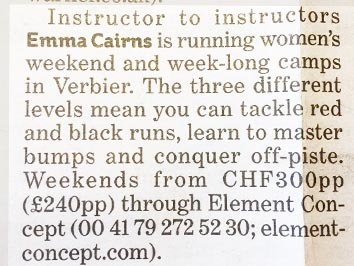 After skiing for years and having more than a few ski lessons, Verbier Life journalist Maev Cox came on one of our Women’s Camps and wrote a great piece about Emma and how she runs these weekend and week-long courses, as well as an explanation of the focus on female physiology and psychology. 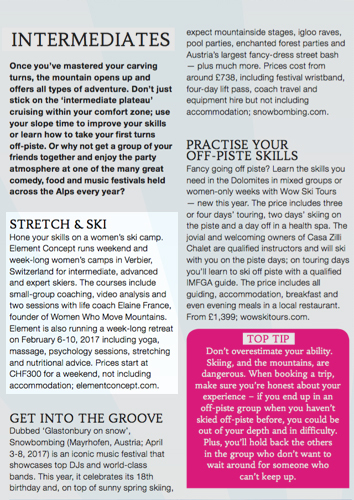 Released on World Women’s Day, Mpora published this online piece about Emma and her journey through the ski instructing system – from chalet girl to ski school director. 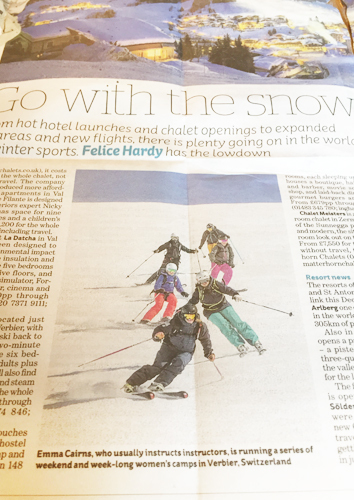 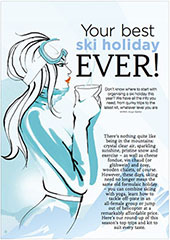 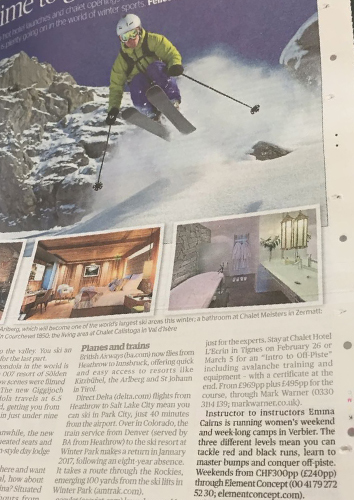 The piece also looked at the statistics surrounding female skiers and female ski instructors. 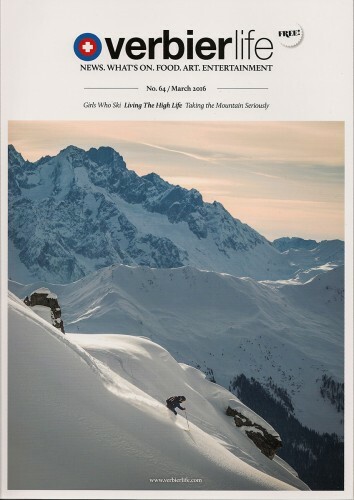 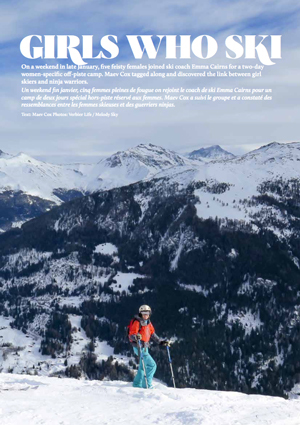 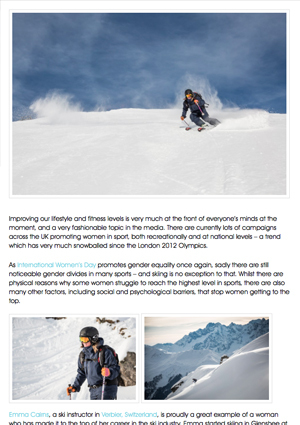 Ski in Luxury took an interest in Emma’s story and looked at the differences between the way men and women respond to the challenges of skiing, and used Emma’s story to contrast with the perceived trends in skiing and ski schools. 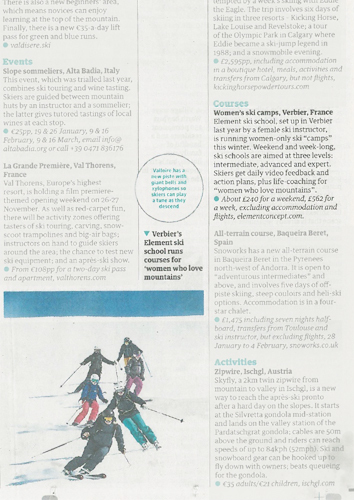 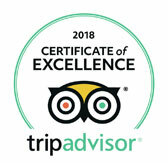 In an article about women’s camps all over the world, Departures named our women’s courses as one of their “Top Notch Women’s Ski Camps” – credit to the ski lessons and Camps that the ski school has been developing for female skiers.